(1969) House of Pies, Los Feliz | Remains of L.A.
-It seems like the place should be decorated with an exciting and colorful pie motif, and so is disappointing in its drabness. 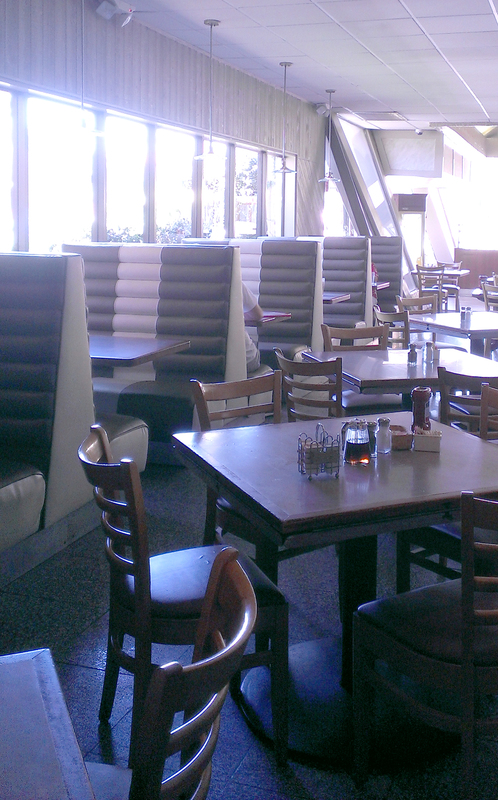 The booths and chairs are gray, brown, and cream, with light gray wood panelling not the walls that aren’t plain white. A few pastel cliff-side beach scenes hang on the walls. Over the counter at the front are lit signs listing the many different kinds of pies. -I got bacon, toast, and a fruit cup. The bacon was perfect. I forgot to ask them not to put butter on the toast, which was awesome. I really do make it a point to not get butter, but if I honestly forget I’m allowed to go ahead and eat it. I put strawberry jam on the toast, but not very much, because of the sugar. The fruit cup was entirely cantaloupe with maybe two pieces of honeydew, but it was good cantaloupe. -I considered sitting at the counter, but they had very tall stools and I just didn’t feel up to balancing. There weren’t any booths free so I sat at a table, and then right after the waitress brought my water the place started to empty out and there were lots of booths but I felt like it would be too awkward to move. The table was all right. -A woman sitting behind me said “what’s the story morning glory?” and the song Telephone Hour ran through my head for the rest of lunch. I like that song. -A man sitting near me who looked like–but was not–Wilford Brimley was wearing a loud Hawaiian shirt and a straw fedora type hat, which he kept on, sitting at his table with his companions, throughout the meal. I know that some younger folks just haven’t been taught proper hat etiquette, but this guy was definitely old enough to know better. -Right before I got my food I noticed my table was sticky, like someone had spilled maple syrup while eating french toast. Probably they’d given the person sitting at the table with them a bite of their french toast, or it could have been pancakes, and when they did a single drop of syrup fell and they didn’t notice because they were exclaiming over how good the french toast (pancakes?) was or possibly were in the middle of planning a heist which worries me because you have to notice details when you’re doing a heist and they clearly didn’t notice the drop of syrup, and it only takes one drop to make things sticky. Maybe they think it doesn’t matter but they’ll be sorry when they also don’t notice small details like that while executing their probably-diabolical plan. It was no problem, though; a guy was wiping down a table near me and was perfectly happy to wipe down mine as well. -While I was squeezing past tables on my way to the restrooms, I overheard an old man, who was sitting with a young woman and a baby, telling her about the Seuss book Horton Hatches the Egg. He was struggling to remember the refrain about an elephant being faithful 100% so I paused and recited it for him. He was delighted and grateful; the young woman looked at me like I was crazy. Whatever; I work at a library. It’s practically my job to accost random strangers who can’t remember lines from books. -There are four restrooms, two for men and two for women, all single stalls (I’m assuming that the men’s are the same as the women’s; I didn’t check). They have those color-coded latches on the doors, like you see on airplanes, with red for locked/occupied and green for unlocked/unoccupied. I didn’t notice this until after I opened a door with a red latch and found it both unlocked and unoccupied. -A woman seated with her back to me and wearing a tank top had a tattoo of Marilyn Monroe’s face on her back shoulder. I kept feeling like it was looking at me. -I asked the waitress if I could get another napkin and she looked into my eyes and said “yes” with the sort of intense sincerity you hope to see in a surgeon, or a defense attorney. 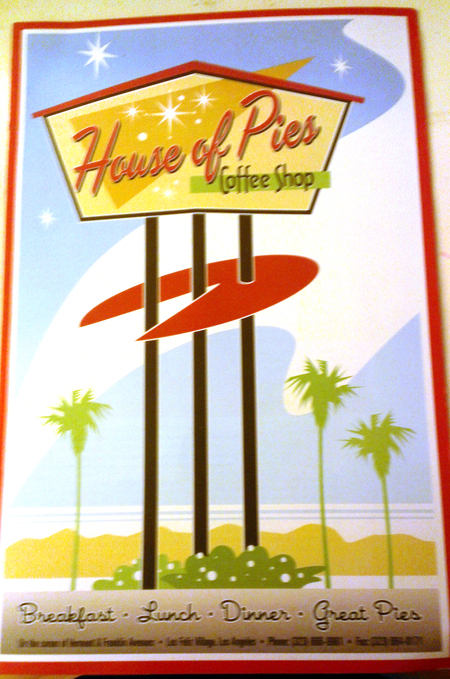 -The drawing of a House of Pies sign on the menu is much cooler than the actual House of Pies sign outside. The sign outside used to have the symbol for pi at the top but they removed it, for no reason I can imagine. The sign on the menu doesn’t have it either. 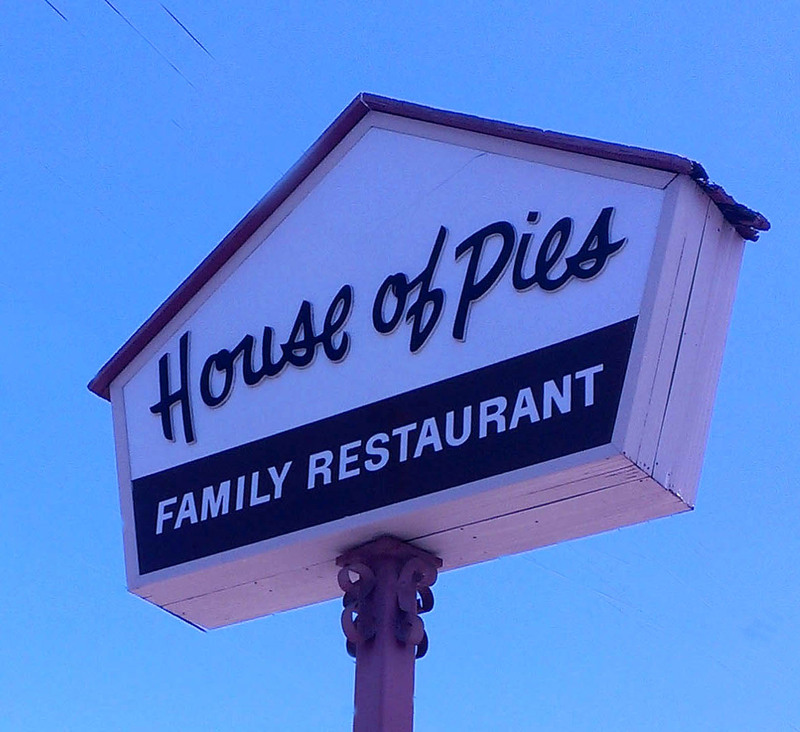 That pi symbol was probably my favorite thing about the House of Pies. -At a booth near me a boy–ten or eleven–was having lunch with his grandfather. They were a delight to watch; they talked and laughed like absolute peers, just two guys who really enjoyed each other’s company. -A guy sat at the table next to mine and ordered a sandwich. When he was done saying what kind of sandwich he wanted he barked, “No pickle, no pickle, no pickle.” A small, mean part of me hoped it usually came with four pickles. When the sandwich did arrive, there were no pickles but he sent it back anyway because it had tomato and lettuce and he forgot to say he didn’t want those either. What I Ate: Bacon, toast with butter and jam, fruit (mostly cantaloupe). What I Read While I Ate: Three short stories from the collection Reginald by Saki. I’ve read them all sixty times before. They are marvelous. For instance, quoth Reginald: “to be clever in the afternoon argues that one is dining nowhere in the evening.” Oh I love Reginald. I always think of Saki as a precursor to Wodehouse but slightly more bitter. What Sort of Ghost I’d Expect to Find if I Believed in Ghosts Which I do Not: Four women from the PTA, who would come and conspire against the other members over pie and coffee. I just visited a nice retro Denny’s after not being in any Denny’s for many years. Well, it’s not just about the food, of course. You go there to see what you might see, overhear this or that. The day I was there I sensed a nice calm amongst mostly blue collar workers and some younger people. It’s wasn’t crowded but there was a steady flow of customers. I liked it. It is smack dab in an industrial part of Seattle. We don’t have nearly as many diners at L.A. as I’m sure you know. But we still have more coffee shops.